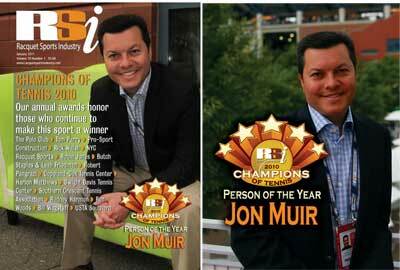 VISTA, CALIF. — Jon Muir, the president of the Tennis Industry Association and the worldwide general manager of Wilson Racquet Sports, has been named 2010 “Person of the Year” by Racquet Sports Industry magazine in the publication’s January 2011 issue. Muir led off the magazine’s 10th annual “Champions of Tennis Awards,” which honors people, companies and organizations dedicated to improving the sport and business of tennis. Muir was named TIA president in 2009. Recently, the TIA board of directors agreed to have Muir, age 40, stay on for another two-year term. He has been lauded as a key leader in the tennis industry and he also serves as an appointee to the U.S. Tennis Association board of directors. In his day job, Muir presides over one of the world’s largest tennis brands, which counts top pros among its ranks including Roger Federer and Serena and Venus Williams. The magazine said it was Muir’s dedication to the tennis business and his “vision and talent in helping this sport to grow and in bringing all industry groups together” that has made him Racquet Sports Industry’s 2010 Person of the Year. Increasing the number of frequent players in the U.S. Better defining the economic impact of the tennis industry, so as to identify ways to increase growth. Developing communication channels for clear, consistent messaging about tennis and the reasons to play. Private Facility of the Year: The Polo Club, Boca Raton, Fla.
Stringer of the Year: Tom Parry, Bradenton, Fla.
Builder/Contractor of the Year: Pro-Sport Construction, Devon, Pa. Sales Rep of the Year: Rick Walsh, Kansas City, Kan.
Pro/Specialty Retailer of the Year: NYC Racquet Sports, New York, N.Y.
Tennis Advocate of the Year: Robin Jones, Cary, N.C. Junior Tennis Champions of the Year: Butch Staples & Leah Friedman, Chicago, Ill.
Grassroots Champion of the Year: Robert Pangrazi, Tempe, Ariz.
Municipal Facility of the Year: Copeland-Cox Tennis Center, Mobile, Ala. Wheelchair Tennis Champion of the Year: Harlon Matthews, Athens, Ga.
Public Park of the Year: Dwight Davis Tennis Center, St. Louis., Mo. Professional Tennis Registry Member of the Year: Rodney Harmon, Jacksonville, Fla.
High School Coach of the Year: Bill Wagstaff, Spokane, Wash.